Mike and I decide that we should probably formalize our partnership terms on the book to avoid any confusion down the road. We are both on the same page about what partnership means, but it sounds like a good idea anyway. Jointly creating intellectual property does create some unique questions worth answering (e.g., what happens to the intellectual property rights if one partner drops out part way and the other wants to continue). Besides he has an old coauthorship agreement draft he did for a past project that can be an easy starting point. He will mark that up and get it to me. From the first time I shared the idea with him, I said I wanted to be true partners - 50/50 on everything. Sure, the original idea is mine but I know that Mike brings a lot to the table that I lack that complements the idea. Mike's experience successfully publishing a book opens doors and helps us avoid rookie author mistakes. He also has built a great marketing platform with his thousands of readers of his book and business blog. He is a prolific writer how has learned to communicate business topics in a compelling way. Finally, he is a great and smart guy I have been partnering with on other things and really enjoy working with. Overall, a no-brainer. I do have exactly one thing I would like to not split right down the middle and I'm a bit uncomfortable saying so. One of our names has to go first in the author line and, for some reason, it would mean a lot for me to be first. 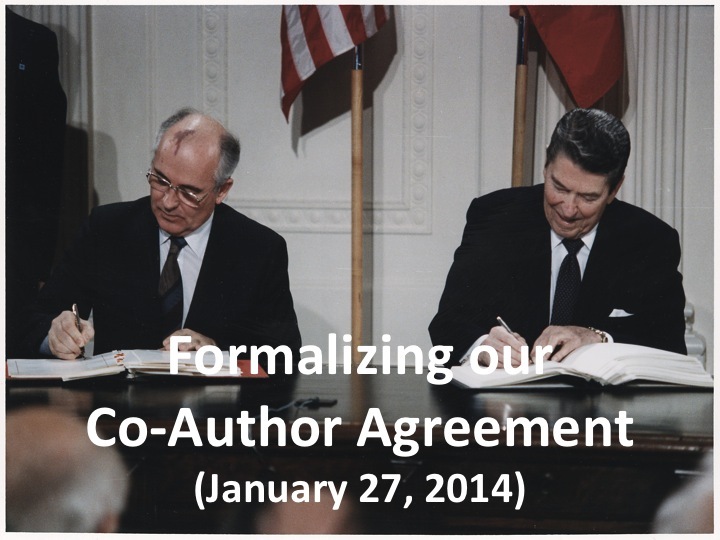 Before I even ask, Mike has already taken care of that in the draft agreement, noting me as "author" and him as "coauthor" with my name going first. Everything else seems pretty common sense and I send it off to an attorney specializing in copyright law to give me an expert read. (I use eLance.com to bid out my legal projects and have been very happy with the service.) We agree to finalize any tweaks after incorporating any changes from the attorneys. I'm not 100% sure this book will ever produce a penny of revenue, but now it is incurring some real expenses. This is getting real.